Who doesn’t love Google Doodle? It isn’t always about the big things – sometimes it is about the attention that you pay to details; and sometimes those details can be whimsical little things that give someone a moment to pause and smile. I generally notice when Google dresses up their search engine to celebrate some kind of momentous occasion, but every now and then they will do something that stops me in my tracks and makes me dig a little bit deeper. You get to learn about historical personages that you might never have stumbled across; different events you had forgotten or never known about; or just interesting ideas that don’t usually get a light shone on them. It is things like this that mark Google out from their competitors, and gives them that edge which makes you sit up and take notice. Sure, all the mechanics of what they do are the real solid underpinning to anything like this, but the Doodles really do seem to represent something essential to their philosophy and an attractive aspect to their corporate identity. It started off in 1998 when the founders were at the Burning Man Festival, and wanted to communicate that through toying with the corporate logo. Since that point, after Dennis Hwang produced a popular Doodle for Bastille Day, they now have a team dedicated to producing the illustrations used in the Doodles. As a company you know that there are certain things that you have to do – you have to provide your clients with the best possible products and the best possible services that you are able to; these are the basic building blocks and why you actually exist. Doing something fun, and something that communicates on an aesthetic level – how does that help? Well, aesthetics are a little more than just window dressing – they can convey a certain ethos and attitude to how you conduct yourself, and they can be a conversation starter that opens doors mere corporate-speak might be ill-equipped to do. Adding something aesthetic to the world is also a good thing, and for a company that is integral to the presentation of a lot of people’s websites and own corporate identities, it performs a very important function … it lets you know that Google have their own very finely tuned sense of style too; that they have ideas of design that you can agree with. 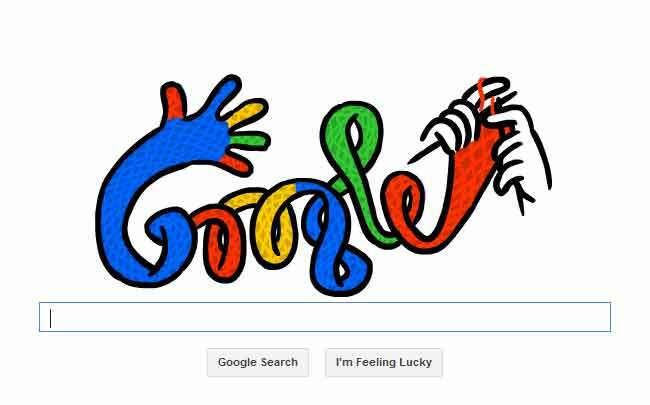 Doodles – born from a very fun idea, and continuing that sensibility; just another reason to like Google and a great advert for them.